It’s time again for MeshU. I wrote about why startups should consider attending MeshU over on StartupNorth. This is a great opportunity to learn and connect. Bill is a colleague of mine at Microsoft. He also had a profound influence on my career. I was training to be an academic. I wanted to do research like my idols (including Bill Buxton), but Bill’s session at CHI’97 in Atlanta is where he espoused that we’re all designers. We’re all designing and building and shipping software that people use. Imagine that. He is an exciting, engaging speaker that any startup, executive, designer, developer should listen to. The #leanstartup thing has become a movement. Whether you’re lean or you’re fat, you there’s something to learn about product development and marketing from the guy that brought Xobni, EventBrite and Dropbox to market. I think every startup and every marketer needs to at least listen to what Sean Ellis is saying. I’ve never met Aza, but he works with 4 people that I think are top notch at Mozilla (I’m looking at you Beltzner, Shaver, Lilly and Surman). I’ve written about his work at Humanized, I used his product Enso as my launcher in Vista. And one of my close friends actually worked on the Canon Cat with Aza’s father, Jef. Aza is the creative lead for Firefox. If you were looking to learn from someone that is helping to build the fabric of every web experience (well technically 24.69% of all web experiences ;-), there’s a good chance that Aza will teach you something. Diana is a developer rockstar. She’s moving the entire backend at Freshbooks from PHP to Python. This is a crazy project. Switching languages in real-time with the application still running. This is like performing a heart transplant with the patient still conscious. You can learn something about engineering complex systems from Diana. Profitable in 2 months at Flowtown, that’s crazy. Hopefully that includes founder salaries. But you get to hear from the trenches about building a startup using customer development. You’ll learn about “customer development, feature prioritization, split testing, product metrics and agile development as approaches to increase your probabilities of succeeding”. Geolocation infrastructure startup with “the” set of investors (Ron Conway, First Round Capital, Chris Sacca, Kevin Rose, Tim Ferriss, Shawn Fanning people). He was the lead architect at Digg. So if you don’t think you can learn something from the guy who built the infrastructure that created the tsunami that spawns “The Digg Effect“. Then forget about scalable architectures and ask him about raising money. And this is only 6 of the 13 speakers. There are world class people coming to Toronto. Hopefully everyone from Montreal to Waterloo realizes that this a big deal. The speakers are of the calibre that you’ll find at a conference in Silicon Valley, San Francisco, New York , Austin, Vegas, where ever. MaRS only hold 400 attendees. This is an incredibly small conference venue. If you’re smart, lucky, outgoing without being douchey, you have a pretty good chance of meeting the speakers and other attendees that are pretty awesome. The thing to remember is that a chance meeting at a conference with any of these individuals isn’t going to change the course of our startups. You’re looking to make some initial connections. I feel like I tell a lot of entrepreneurs that you don’t have to get everything about your startup on the table in 30 seconds. None of these people have the power to change your life in 30 seconds. It’s like dating, as much as you want to “hop on the good foot and do the bad thing”, it does require a little bit of conversation. (If you really need instant gratification, there are a lot of consultants/charlatans/snakeoil salesmen that will take your money and tell you that if you do these 3 things you’ll be more awesome). 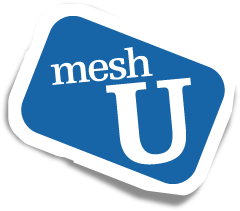 Events like MeshU aren’t tradeshows. You’re not likely to find customers. You’re not going to find booth candy. You’re probably not going to find an investor (though if I was a Canadian angel or early-stage investor I’d be there just to meet the entrepreneurs and maybe learn something to help my portfolio). You’re there to meet potential hires, other entrepreneurs that you can share war stories and lessons. The whole point of an ecosystem is to enable the exchange of value. The value can only be exchanged between connected nodes in the network. The ecosystem gets strong and more valuable the more connections we build. My advice is to start thinking about the connections and the learnings that will justify the price. Then go register for MeshU.